One year ago today, I became the happiest mancat in the blogosphere! August 19th, 2013, Miss Pia Bean Cole of the Colehaus Cats told the whole wide world that she had the loves for me!!!! It was a Mancat Monday of Summer Love ... but who was to know that I was the Mancat who was the focus of such floofy ginger affection! There's a card and everything... just for me! Mom helped me read it... And it's got something reeeeeeeeeeaaaaaaalllllly special in it! LOOK! Pia made me a heart out of her beautiful furs! Oh my, she smells like ginger sunshine! Then, mom helped open the package and OH MY COD! I nearly fainted it was so amazing!!!!! 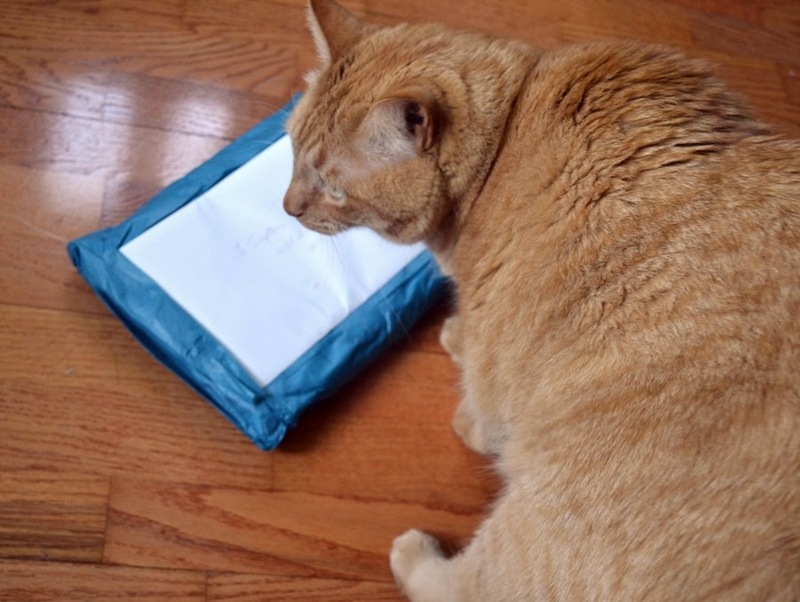 It's one of Ms Stacy Hurt's (of "on a more personal note... From Ms. Stella O'Houligan" bloggy) beautimus, super special Catnip quilts! Oh and LOOK! It's got me and Pia right on it! How did she do that? OMC ! it's so AMAZING! And look she really does only have eyes for me! I'm so happy! Oh my dearest 'lil bean, once again you have made me feel like luckiest mancat in the whole of the interwebs! This is the pawesomest gift ever. Mom says it's to special for me to lay on, an I sure don't want to share with those other doods (you heard me bro's, get your own special ladycat! ), so we'll put it up on the wall near our giant tree so I can be near it always. Thanks so much to Ms. Stacy and especially to your mom (Thanks Mom Cole!) who helpeded you get this super special present together. Now, I'm just imagining this is truly you as I zoom in for a little kiss! MUAH! Oh that is so terrific and what a wonderful gift from your nice Lady friend. You two sure make a great couple.So Happy Anniversary to you two. How very sweet of Pia. That is wonderful and happy anniversary to you both. Have a terrific Tuesday. How lovely that Pia sent you that lovely gift Dexter. We hope you have a Happy Anniversary. How sweet- that fur heart is priceless. dood....total lee awesum oh yur wife ta sends ewe such a way kewl annie fursary gift...most wives be like...oh, itz R annie fursary.. can eye haza 2015 CATillax car ...eye getted ewe a tie !!! manee yeerz o happee nezz a head two ewe both...yur wife iz one gorgeous gal N way rockin kewl !!! de best oh fishes two ewe both....we due knot haza member ship in de tabby club sew we hope ya haza fun time ther two day !! Oh, that fur heart is too sweet!!! Ginger sunshine! Oh, Dexter, you are so romantic! I hoped you wouldn't have minded my extra furs. You know, love heart of mine, I do only haz eyes for you. All those other Mancats are nothing next to you! Happy Anniversary, sweetheart, and good whiffies all day long! Wait, so your bros can't lay on that quilt wif you, Dex? Does that include honorary brofurs? MOL, just kidding, dude. That's super special and sweet -- what a wonderful present from your sweetheart Pia. You two make a cute couple, for sure! That is a beautiful quilt that Pia had made especially for you. The fur heart is very romantic. Dat are a pawsome present! That sure is a special gift! Concatulashuns to both of you! happy anniversary to you both. We were happy to pawticipate in you TCC surprize for Pia. Happy Anniversary - what a wonderful surprise. p.s., And that fur heart. OMC! That has got to be the most sensational gift ever. That's amazing heart singing purrifically beautiful! So much to celebrate!! Awww, Dexter! Such a romantic day for you and Pia! We iz so happy you lovz yer nip quilt. You may wantsa have yer mum iron it a bit on the back side if shez gonna hang it up. Tho we hope she lets you roll around on it for some timez to get the smellz of yer lovezz.We almost sent a kitten alongz too cos then there'd be one less of the wretched thingz here & there's nothing that sayz i love you like a kittenz. but when i wuz stuffin one inna box the noise alerted That Woman and she said we canna sendez live thingz in the post office ox. Thank you, D, for making our day the most wonderful of all. B-E-A-U-T-I-F-U-L!!!!! Happy Anniversary and love this post!!! Young love is grand. She’s so thoughtful. You should cherish her always. We have one of those quilts. It's AMAZING. So glad you have one to enjoy, too!!! - Crepes.